How to Fix bad_module_info Error for most games in Windows 10. HomeHow ToHow to Fix bad_module_info Error for most games in Windows 10. For all Windows users there are certain errors and glitches in the operating system that almost effect everybody. It starts with the Blue Screen of Death (BSOD) killer errors to these minor Bad_Module_Info errors for most gamers in latest version of Windows 10. No matter how updated your Windows is. It can pop up on any PC or System at any time. Most of the time this error shows while playing games. I experienced this for the first time while playing PUBG on my Laptop. While it shows off for most users playing such games like Counter strike: Go , Fortnite, or PUBG etc. So today we are going to bring all the methods and procedures to fix Bad Module Info Error from the latest Windows 10 version. Most of the users complaining on online forums have been facing this error when they installed the Windows 10 update Build 1709. While many have found the error auto-fixed while updating there PC to the latest Build. So if you haven’t updated your Windows 10, then it’s recommended to grab the official Windows 10 1803 build which is expected to get released on April 30th, A couple of days from now. Now moving to the Fixes. 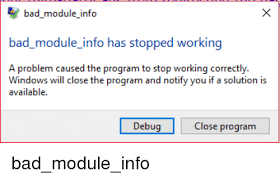 There are five different Solutions mentioned here which can fix this Bad_Module_Info error from your Windows 10 PC right now. All you have to do is follow these solutions are given in these small step by step guides below. When you see the error on your system, Mostly while playing the Online game. The only way to get rid of it instatntly is to press the “Windows Logo Key”. This key is mostly located in updated systems keyboards beside the Left Ctrl and Alt key. Many users in an online Gaming forum have suggested this method to work temporarily for them and let them finish their PVP online game. 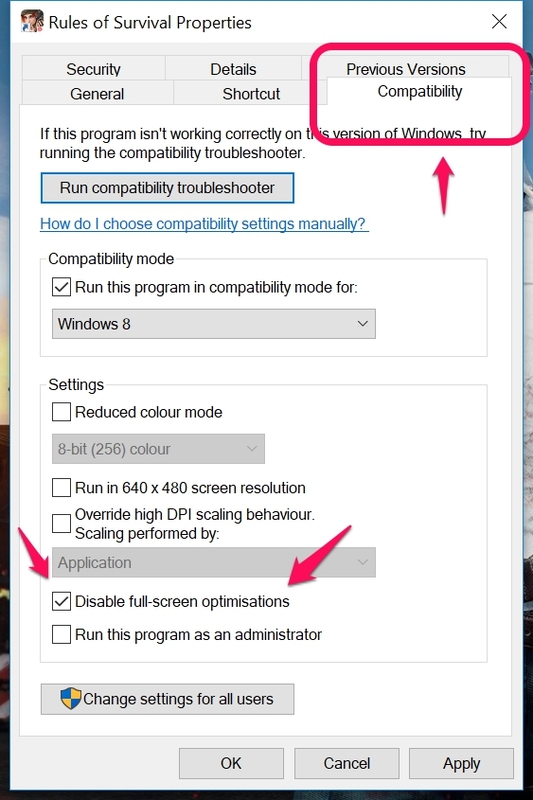 Many applications in the latest version of Windows 10 use this Full screen optimization feature to improve better graphics performance for their app features. Enabling and disabling the full-screen optimization of any game is simple and easy. All you have to do is follow these steps. Step 1)- Head to the game icon which you want to optimize. Step 2)- Right click on the game icon and go to properties. Step 3)- Now move to the Compatibility tab. Step 4)- Look for the Disable Full Screen Optimization and check it. Step 5)- Once done simply click Apply and OK.
Now you can turn reset your computer or you can simply reset your game only and you might not see the error again. In most cases this new error has been seen with the older version of Graphic Card Drivers. Especially for the NVIDIA GeForce series Graphic cards. The issue has been solved by the developers but you have to manually update your drivers to the latest version. If you don’t know the right drivers for your card. You can download and install any 3rd party Driver finder software on your PC to find the culprit drivers and replace it with the right ones. As mentioned above in the Full Screen Optimization method. You can also make some little changes in it and make sure to check the Run As Administrator option in the given menu. All you have to do is follow these steps given below. Step 4)- Look for the Run This Program As Adminitrator and check it. These are all the methods to fix the Bad_Info_Module error on the latest Windows 10 Build. If you are still facing the issue. You can go to a full reset of your PC. So that it can easily remove all the unwanted Windows 10 Updates and fix this issue.